WeatherBrains Episode 649 is now online (June 25, 2018). If you are crazy about weather, this is THE netcast audio program for you! Joining us on this episode of WeatherBrains are guest WeatherBrains Benjamin May and Joe Tankersley. Ben came to marketing as a senior executive at Chateau St. Michelle winery. He left this to develop public safety-related “edu-tainment” programs at Disney in Orlando. Teaming with Disney Imagineer Joe Tankersley, they managed to get together a huge pot of funding and create a program that successfully improved preparedness behaviors for hundreds of thousands of people. They teamed with FLASH, and through that, connected with many of the big names in our field. Through those connections, both men continue to be involved with NWS safety campaigns. Also joining us from KMBC-TV in Kansas City is guest panelist Nick Bender. Nick is the morning meteorologist there and the proud father of a new baby boy. WeatherBrains 101: In this episode of 101 we take a look at one of those cloud features you might see as developing updrafts work upward to create a thunderstorm. Be sure to scroll to the bottom for a special picture. The WeatherBrains crew includes your host, James Spann, plus other notable geeks like Nate Johnson, Bill Murray, Aubrey Urbanowicz, Rick Smith, Kevin Selle, Kim Klockow-McClain, and Brian Peters. They bring together a wealth of knowledge and experience from various views for another fascinating netcast about weather. 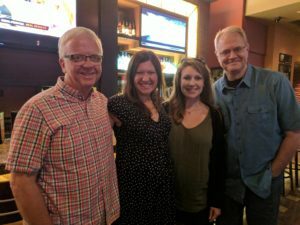 Several of the WeatherBrains gang are in Norman, OK, where they took this picture on June 25, 2018. From left to right, Rick Smith, Kim Klockow-McClain, Aubrey Urbanowicz, and Kevin Selle.